A young Christian researcher and film maker, Keith Thompson, has published an outstanding work on the topic of the one world religion movement. 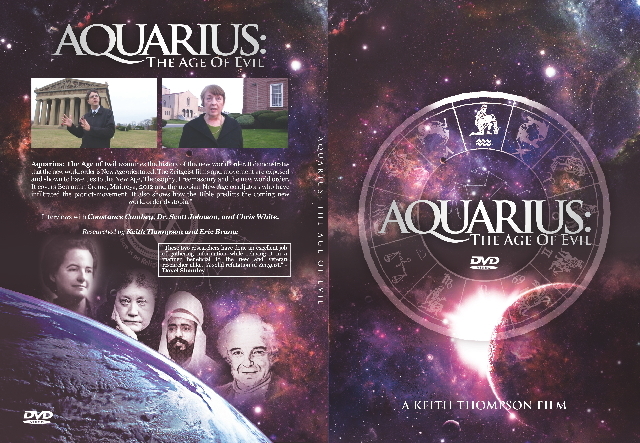 His latest film, Aquarius: The Age of Evil, is a look inside the beliefs of One World /New Age occultists. I am saddened that our young people have to deal with such subjects, but thankful that God has gifted young people like Keith Thompson to help his generation understand the times in which they live. Keith goes on to say that the New Agers believe that we are coming out of the age of Jesus (Pisces) and that we will have a new teacher in the Age of Aquarius. About a year ago, an acquaintance told me that I should watch the Zeitgeist “movie” on You Tube. I did. I found some of the information interesting. The problem with it: Christianity is marginalized and discredited. There’s a lot of that going on these days. 10let it be known to all of you and to all the people of Israel, that by the name of Jesus Christ the Nazarene, whom you crucified, whom God raised from the dead–by this name this man stands here before you in good health. 11“He is the STONE WHICH WAS REJECTED by you, THE BUILDERS, but WHICH BECAME THE CHIEF CORNER stone. This last verse is under assault from hundreds of different directions. Less than a minute later he said it again: “The international order we seek is one that can resolve the challenges of our times.” The man was talking to talented young Americans who have chosen to defend this nation and he has the nerve to talk of an international order on the day of their graduation? Mr. Obama’s statement is a sign that a one world government is coming. There as so many other signs. We don’t hear much about a one world religion. As a Christian, I believe that the scriptures are clear. A one world religion will accompany a one world government. This is the reason that Keith Thompson’s work is timely. His documentation is flawless and his theology is Biblically sound. The film is well worth your time. Keith’s original intent was to upload the movie to his You tube channel so that it would be free to all. After uploading the movie into sections, parts of it were “flagged” and removed by You tube. Someone complained that sections of the documentary made false statements. What was false were the allegations as all of Keith’s work was backed by documentation. Unfortunately, this fact didn’t stop parts of the film from being “flagged” and removed. Keith ended up selling the DVD on two different websites. Months later, all sections are up in various places on You tube and the documentary can be seen in its entirety for free. This is a 2 ½ hour documentary. I have read the entire text of the documentary and have sent a review to Keith. He was appreciative of my remarks. This probably won’t work, as the links surrounding this movie, including interviews, change constantly. This entry was posted on Saturday, May 22nd, 2010 at 8:34 PM and is filed under Bible Prophecy, BIG GOVERNMENT, Commentary, globalization, News. You can follow any responses to this entry through the RSS 2.0 feed. You can leave a response, or trackback from your own site.